Seasonal crafting: knitting in winter and sewing in summer? Just like there is a movement toward eating food in season, it feels like there are also seasons to crafting. It is hard to be motivated to knit with wool when the temperature rises. Knitting with cotton yarn is not so bad, but these days, I’m more interested than anything else in sewing. 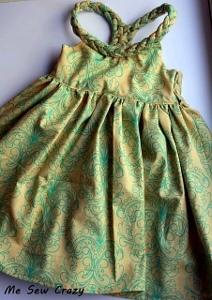 As a child of the late 70’s, my mother sewed all our clothes. I remember sitting in her sewing room and watching her foot go up and down on the pedal and listening to the whirr of the Singer sewing machine. She has a beautiful antique sewing table with the metal pedal on the bottom that was used to sew with antique machines. We used to have great fun pumping it up and down and squishing our hands or feet underneath by accident. My sister-in-law is a big fan of Kijiji. So when I told her I had found an ad for an estate sale where they were selling yarn and wool, she did not hesitate to say when I asked her to accompany me. We must have spent over an hour looking at everything that was there. The daughter of the woman’s whose wool it was said that other people had already been through and had bought over $200 (!) of wool. There was still so much of it left! And amazingly enough, some of it also still had the original tags from Eatons! I ended up buying about $15 worth and coming away with about 3 bags full. Then, to our surprise, the lady brings us to the living room in the front of the house where there were stacks and stacks and stacks of fabric! She was not quite ready to sell the fabric because she had not decided on the price but we vowed to go back once she decided what to do with it. So last night, we went back and found more than enough fabric for our projects. My sister-in-law was looking for curtains and upolestry fabric. I found these neat fabric scraps that look like wool that I am hoping to make into a quilt. From my research on the internet, I could make a simple quilt using a zig-zag stitch to conntect it all together. We’ll see where this goes. I’ll post pictures of what I found shortly and the project I plan on making with this fabric.